More than four decades after making her debut in ALL STAR COMICS #8, the World’s Greatest Heroine was comprehensively reimagined in 1986 by legendary comics creator George Pérez—and this new incarnation of DC Comics’ fabled Amazon Princess quickly rose to unprecedented levels of popular and critical acclaim. Working with such talented collaborators as Len Wein, Mindy Newell, Chris Marrinan, Jill Thompson and Tom Grummett, Pérez went on to craft Wonder Woman’s adventures for years, spinning masterful stories that ranged from heart-stopping battles with the Titans of myth to heartwarming interludes with Diana’s trusted network of friends. Now, for the first time, these treasured tales from the 1980s are available in a comprehensive omnibus edition, featuring some of the most exciting moments of DC’s Modern Age! 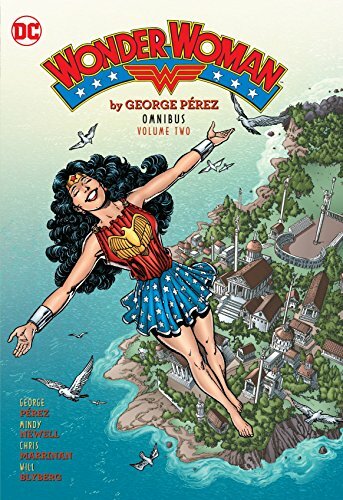 This second volume of the deluxe hardcover series collects issues #25-45 of the historic title together with WONDER WOMAN ANNUAL #2, and features a special bonus gallery of archival art and information.